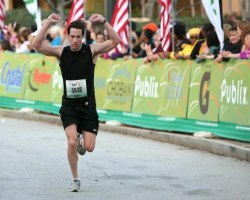 The Publix Georgia Full and Half Marathon will return to the streets of VaHi on March 23 and, as has been the case in past years, traffic in the neighborhood will be impacted. Expect traffic delays and road closings along the course of the Publix Georgia Marathon & Half Marathon, Sunday, March 23, between 7 AM – 2 PM. More than 16,000 participants, 2,500 volunteers and 30,000 spectators will be along the course which runs from downtown Atlanta to Decatur and back, passing through Centennial Olympic Park, Georgia State, MLK Historic Site, Old Fourth Ward, Inman Park, The Carter Center, Candler Park, Agnes Scott, Emory, Druid Hills, Virginia-Highland, Midtown, and Georgia Tech along the way. The following information is provided to help people who live, work, and worship near the Publix Georgia Marathon & Half Marathon course plan their drive during 7:00 a.m. – 2:00 p.m. on Sunday, March 23, 2014. With this information, you’ll be able to see which roads will be impacted by the race and plan an alternate driving route to your destination to minimize traffic delays. Check out the following topics for detailed information about the race course, each street on the course, suggested driving directions to various sections of the course, and other useful information.